Better hurry and reserve your room. August 25 is the last day to receive the special room rate for the 2017 AFL-CIO Metal Trades Department Conference. 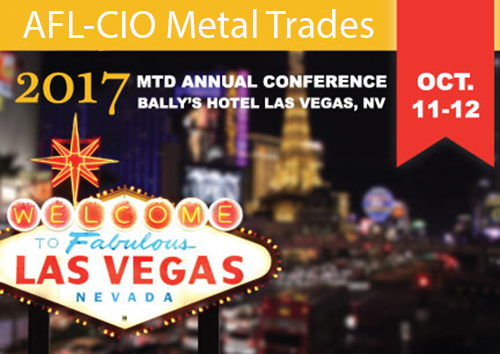 IAM members working in the metal trades are encouraged to attend the conference from October 11-12, 2017 at Bally’s Hotel and Casino in Las Vegas. IAM members should be prepared to attend the IAM delegates meeting on October 10 at 9 a.m. to discuss issues at the department, council, and local lodge level. IAM delegates will discuss ways to improve the lives of our members working in the metal trades. A charity golf tournament will be held on October 9 at Desert Pines Golf Resort benefitting Guide Dogs of America. Anyone planning on attending all events should expect to travel to Las Vegas on October 8 and return home on October 13. Rooms must be booked no later than August 25, 2017 to receive the special room rate of $125 a night, plus a $25 resort fee. Reserve your room here or contact the hotel directly at 800-358-8777 and give the group code SBMTA7 to receive the rate.